“King Of Kungfu 2: Street Clash” is the sequel of our previous fighting kungfu game “King Of Kungfu:Street Fighting”. 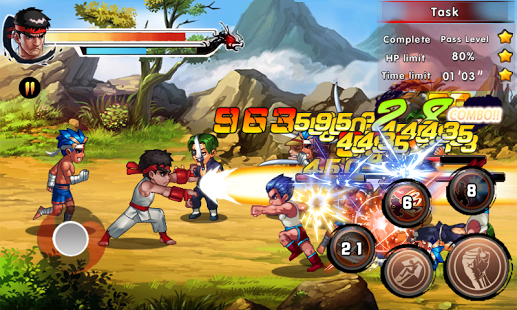 “King Of Kungfu 2: Street Clash” is a simple addictive fighting free RPG game which keeps you playing it wherever you are! Enjoy the pleasure of killing and slaying all the enemies in front of you! Be the king of Kungfu, the last one standing over all your enemies! ?Adrenaline-fueled combat RPG with an immersive, intriguing storyline.
? Plunge into epic combat sequences and render in astonishingly lifelike details by an all-new animation system.
? Very Addictive free game. ?More fighter characters will be your enemies.
? Simple control. Run without mobile data.
? Game modes are available for thousands of hours of enjoyment even when playing alone. ?Quickness is key to win the hand to hand fight. ?Pull-off awesome martial art fighting styles such as “Boxing”, “Karate”, “Tae Kwon Do”, “Sumo”, “Drunken Fist”, “Muay Thai”, and much more with a simple tap of a button. ?More than 10 kinds of defensive gear and devastating weapons. Each of them has their own special effect!
? Upgrade your weapons and gear, enhance your powerful skills for optimal battle experience. ?Take timely decision, attack on enemy with punches and kicks on proper time and block enemy attack by using accurate and speedy action. ★ If you feel hard to deal with opponents’ melee attacks, you’d better run to the other side for little recovery in your battle. ★ Countless opponents come up around your side, so you need to watch out and try to give them a powerful hit to kill and slay them once when they are in the same direction. ★ Besides skills, you can also equip defensive gear and use devastating weapons to deal with your enemies’ melee attack in every battle. ★ Experience and money can help you level up to enhance your attacking power. ★ Pay attention to the limited time and task quest. “King Of Kungfu 2: Street Clash” is the best free games in the genre of street kungfu. Download for free and Enter The Game and Punch to kill all enemy! Defeat thousands of enemies with powerful attacks in amazing, non-stop, 2-D action. Unlimited combos and coherent force effect will bring you enjoyment in this epic action adventure! 1. Remove most of the ads! 3. Add items that restore HP! 5. BOSS support you fight!